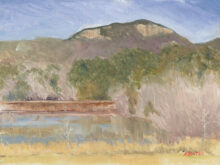 A mirror image reflection doubles the charm of a beloved local landmark. Category: Landscapes. Tags: Binney Park Bridge, Binney Park Bridge painting, Binney Park Bridge print, Bridge art, Bridge painting, Connecticut art, Connecticut landscape, CT art, Floral Art for Sale Online: fine art prints, Greenwich, Greenwich Connecticut painting, Kathleen Bates, Southern Artist. 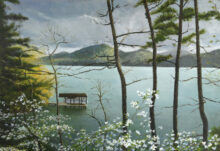 Late afternoon sun peeking beneath the low-hanging clouds highlights the understory of dogwoods and the surface of this mountain lake in northeast Georgia on a chilly, wet spring day. 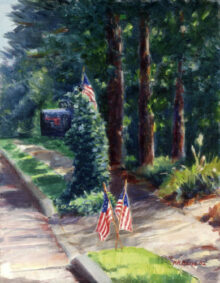 Small flags adorn the end of a neighbor’s driveway and ivy-covered mailbox in the long shadows of late afternoon after 9/11. 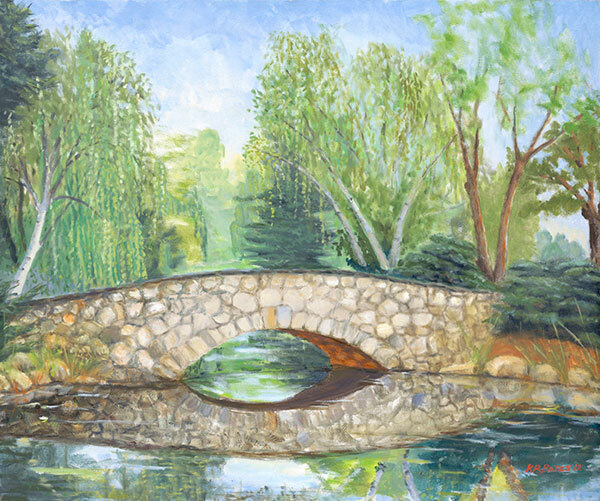 The lush, serene suburban setting is in stark contrast to the terrible events of that day. 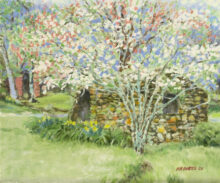 Daffodils and flowering trees adorn an old stone spring house on a farmstead in rural Rabun County, Georgia.